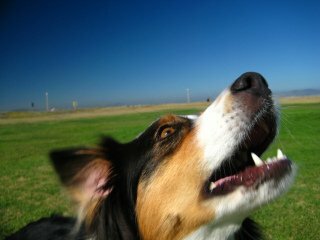 Barking: Image by Misshappiness, FlickrDoes your dog bark on a constant basis, and you can't seem to get him to stop? The right training can get your dog to stop barking in no time. Keep reading to learn how to train your dog to stop barking. There are a number of reasons why your dog might be barking. It's important to understand why your dog is barking in order to train him to stop. Try these methods to train your dog to stop barking. When your dog starts barking, completely ignore him until he's finished. Don't reward him with any attention. Turn your back to him, don't look at him, touch him, or anything else. Once he's done barking, you can once again give him attention. Praise him for stopping, and reward him with a treat. As he stops barking, wait for gradually longer periods of time before you reward him with a treat. This can help your dog to learn to be quiet for longer periods of time. Be extremely consistent when using this method. Remember that by doing anything other than ignoring him while he's barking, you're rewarding his behavior with attention. With this method, you can train your dog that barking is okay until you tell him otherwise. After your dog barks two or three times, praise him, and then tell him "quiet" or "stop barking". At the same time, you should put a treat in front of your dog's nose. The dog should be distracted enough by the treat in front of his nose that he stops barking while you're holding it there. Praise the dog for being quiet during this time. After about three seconds or so, you can give your dog the treat. As you continue this method, gradually increase the time that your dog has to be quiet before rewarding him with a treat. Scold your dog immediately if he starts barking before it's time to give him a treat. Respond with a firm "quiet" or "stop barking". Once your dog is quiet again, you can reward him with the treat. If your dog doesn't stop barking with a command, try squirting him with a little water. Avoid yelling, though, as it might cause your dog to bark more. If you give your dog plenty of exercise, he'll likely be less inclined to bark. Give your dog two walks a day, in combination with play time and regular exercise. He'll have less energy to bark, and he probably won't want to as much. However, never reward your dog with play time or exercise if he happens to be barking. Sometimes it can be helpful to train your dog to do something else when he would normally start barking. Try teaching him to go lay down when there's a guest at the door, or when anything else happens that would normally cause him to bark. Start by tossing a treat to his bed and telling him to "go lay down" or "go to your bed". Once he starts responding to the treat and going to his bed, give the command, and then wait for him to go to his be and lay down before you give him the treat. Repeat this process until he learns to remain in his bed until the door opens (assuming there's a guest at the door). Be sure to reward him for staying on his bed. You may be teaching your dog to bark without realizing it. To get your dog to stop barking, it's important to know what not to do as well. Don't yell at your dog to get him to quiet down, you may be rewarding his behavior, and he may assume that you're trying to bark with him. Remain positive and upbeat during training. Never pet, hug, or soothe your dog when he's barking. This is rewarding his behavior, which may make him bark more frequently. Never let your dog bark constantly outside. 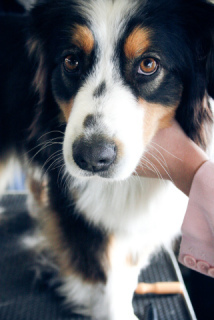 With these methods, your dog will be quieter in no time. Try to avoid quick fixes like shock collars that can cause aggression in some dogs, and cause harm to others.